I know its not a motor racing shot so it would normally be outside primotipo’s focus but the photos were too good to waste, and I will get there, a racing element is here to be found in a little bit. 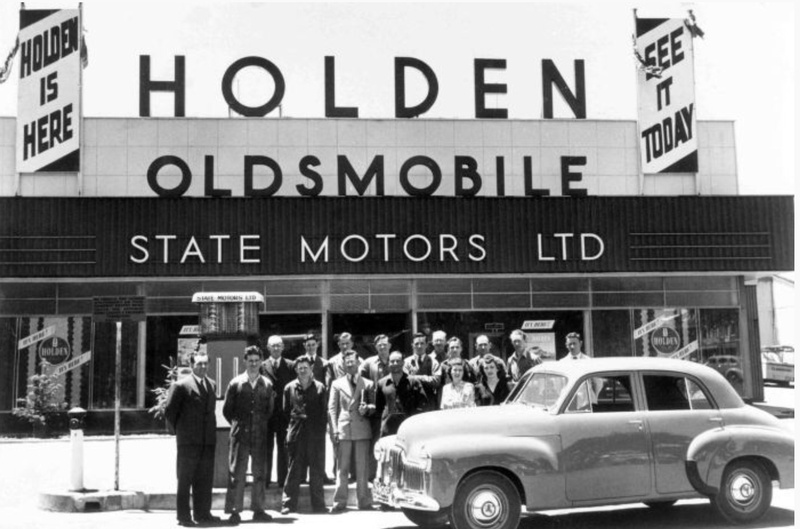 The merger of Holden Motor Bodies Ltd with General Motors (Australia) Pty Ltd as a result of the stress caused to the former during the great depression forged the basis of one of Australia’s great manufacturers and an iconic marque, the merged entity was named General Motors-Holden’s Ltd.
A great Touring Car Racing brand as well- there is the racing link I guess. 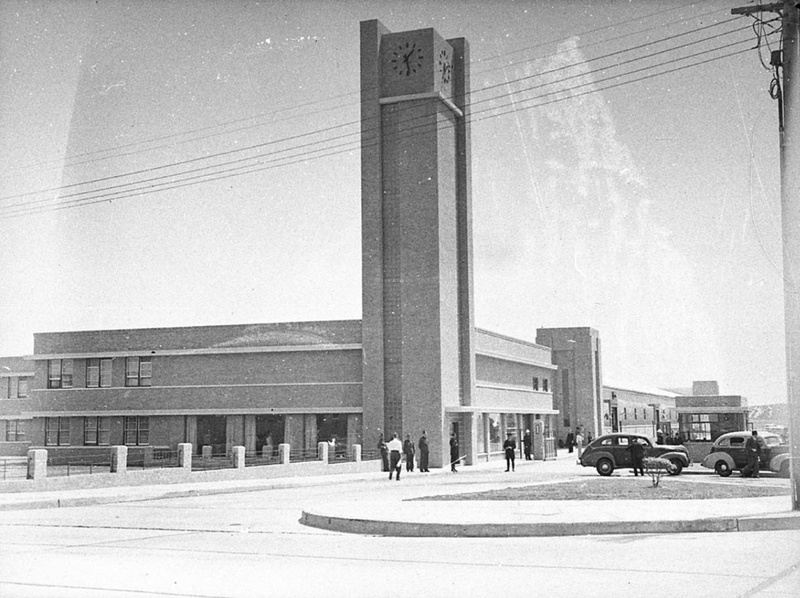 The new company opened its first factory at Fishermans Bend, in Melbourne’s inner west in 1936 and at Pagewood in 1940. 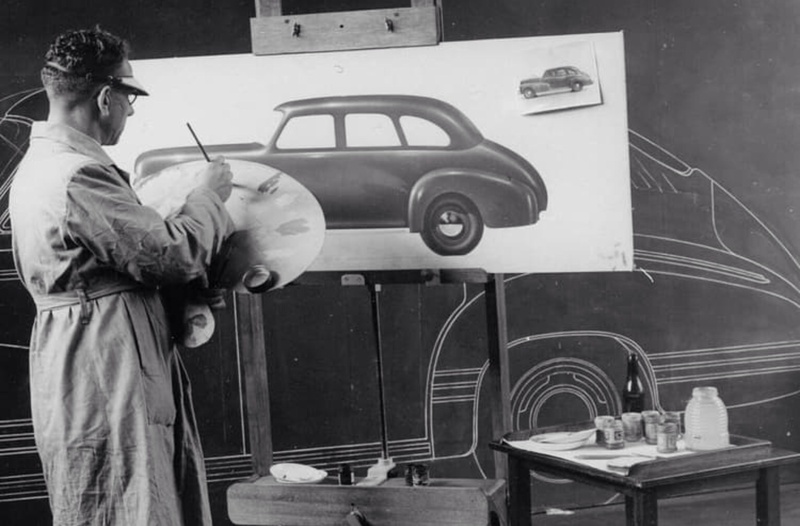 After World War 2 the business made coachwork for Buick, Chevrolet, Oldsmobile, Pontiac and Vauxhall. 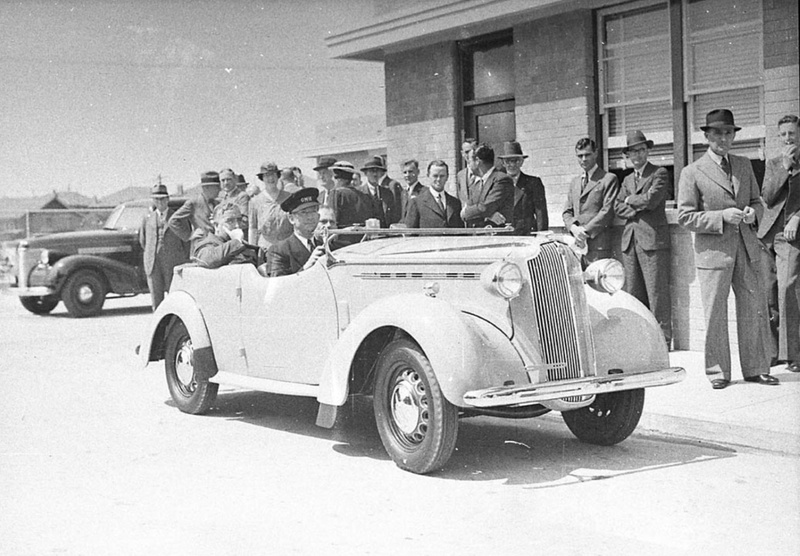 By the mid-forties the automotive industry had the government onside to encourage the development of Australia’s own car. Holden, led by Hartnett got the upper hand on Ford in a pitch by keeping their demands for taxpayer support to a lower level than FoMoCo. 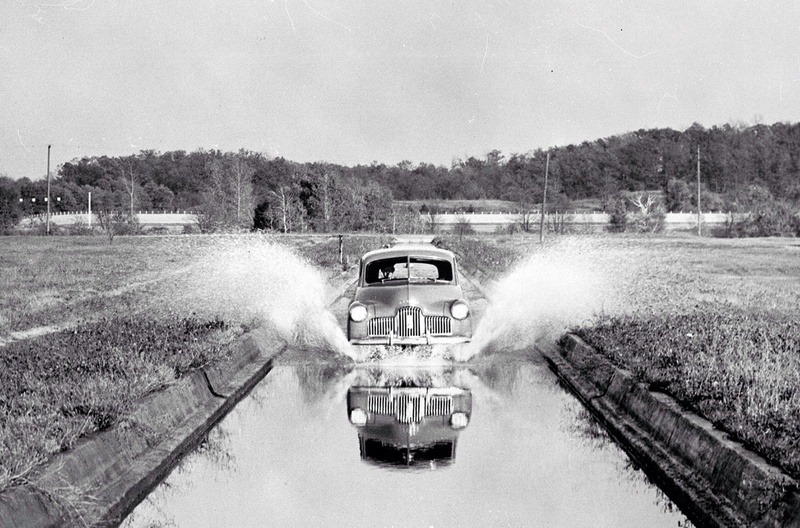 In 1944 the feds invited GMH to build a family car suited to our unique, extreme climatic conditions. 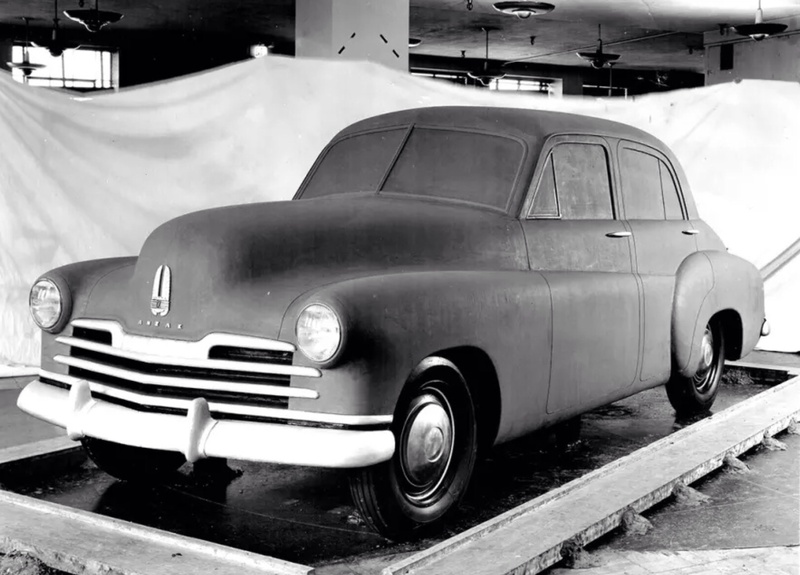 American and Australian engineers hand built three Holden test cars at GM’s experimental workshop in Detroit- the first, chassis ‘19525’ was completed on 30 August 1946. 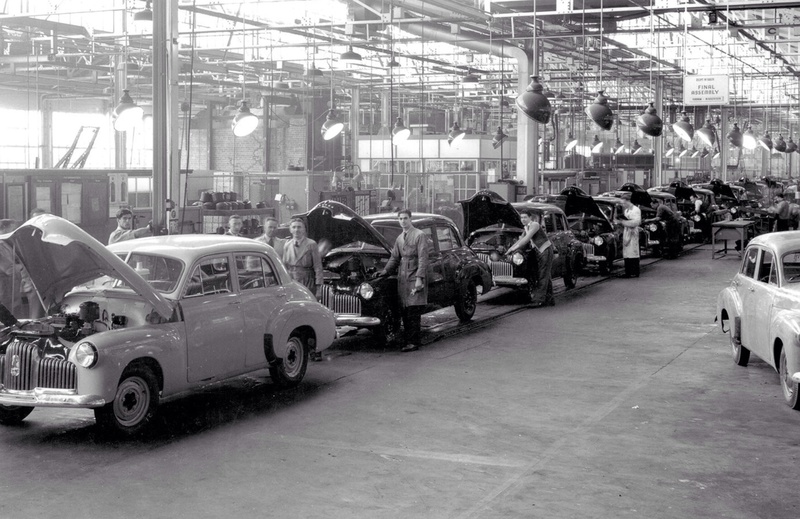 After months of durability tests the cars were secretly shipped back to Fishermans Bend. 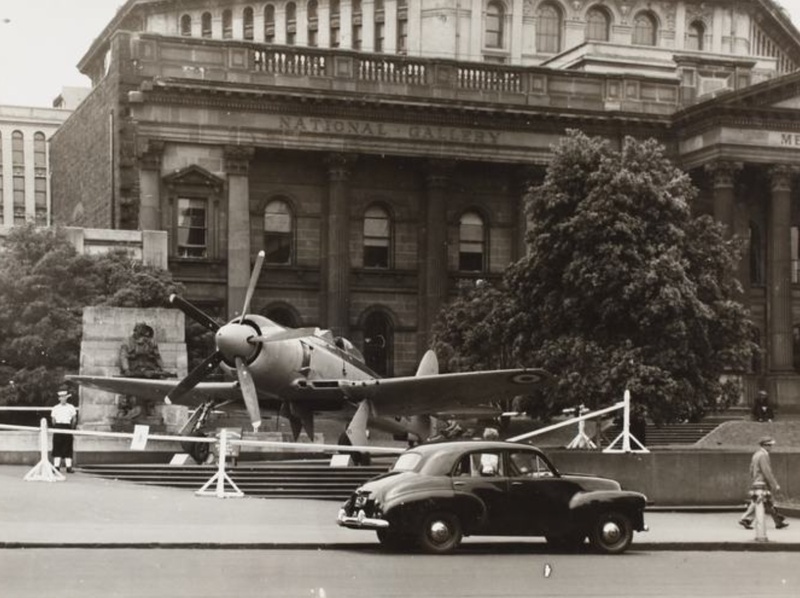 Further testing took place locally and then GMH engineers and technicians built two further prototypes in Australia, the first of these was completed on 22 August 1947- these became the definitive model and shape we all know and love. 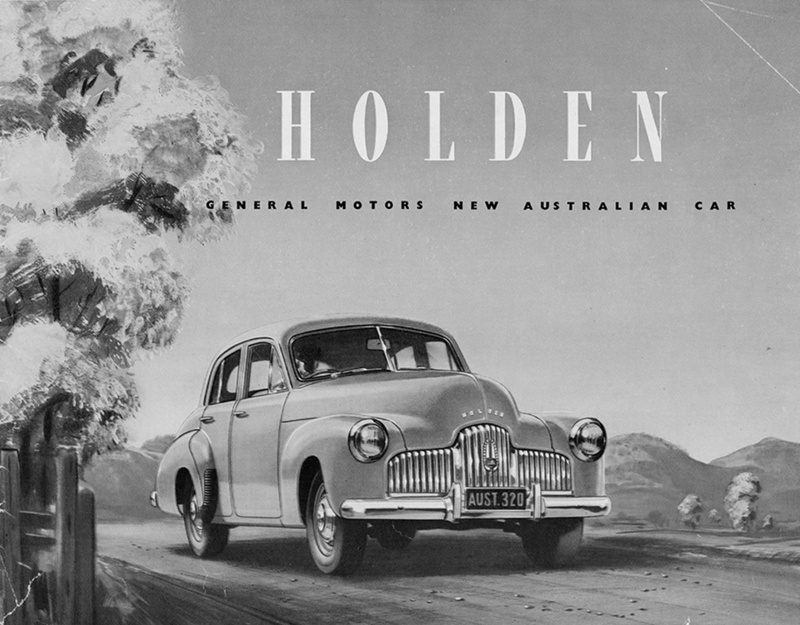 For the record, the first production Holden was completed on 1 October 1948, largely built off-line, it was a ‘Gawler Cream’ 48-215, body #6, VIN ‘8-1001-M’ and fitted with engine # ‘1001’. 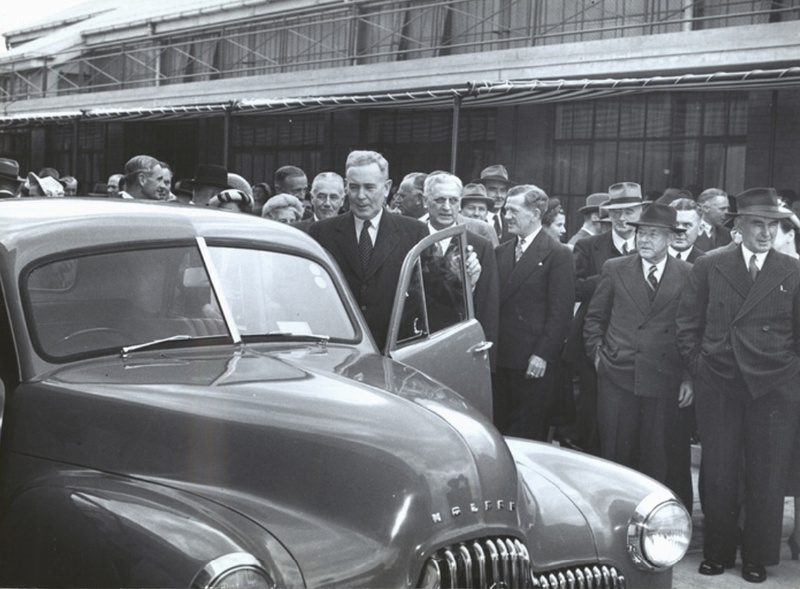 In 1948 in a ceremonial scene akin to the opening image, then Prime Minister Ben Chifley pulled the covers off Holden #1, the ’48-215′ or Holden FX at Fishermans Bend on 29 November 1948, with mass production starting at the heady rate of ten cars a day! Soon production boomed of course, and the rest, as they say is history- including the closure of the final Holden production line at Elizabeth, South Australia on Friday 20 October 2017. 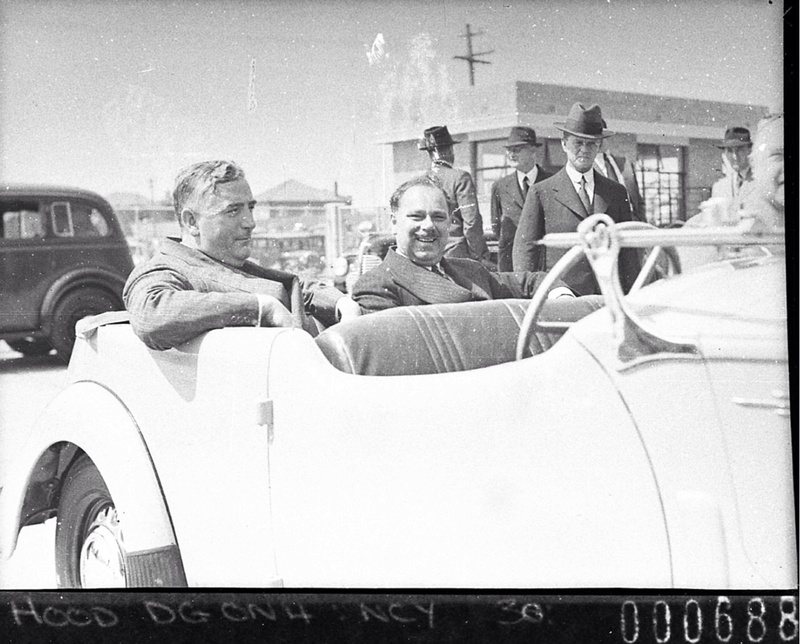 The Australian motor industry as manufacturers of mass-market cars no longer exists. We now have a tiny number of niche companies- god bless Michael Borland and Spectrum Racing Cars down Mordialloc way in outer Melbourne for example. 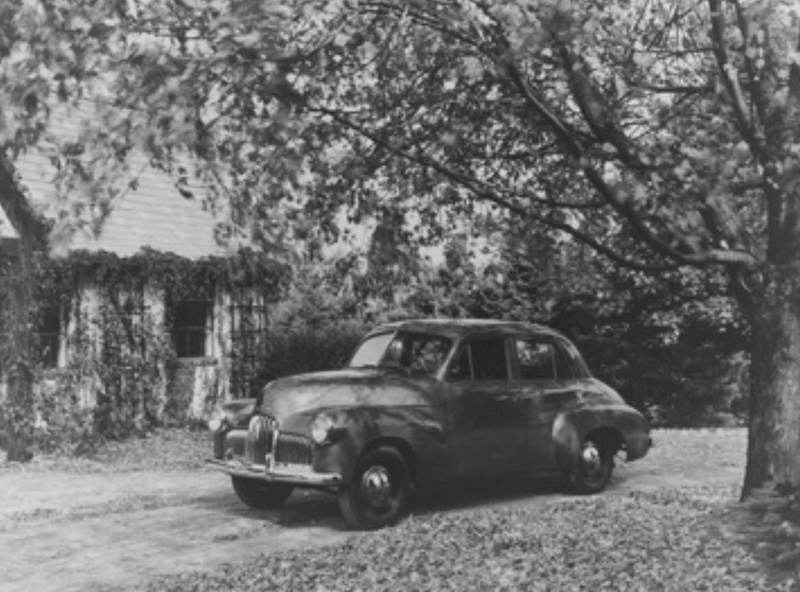 The ’48-215′ was economical, sturdy, stylish, light and with its modern’ish cast iron, OHV, 2171 cc/132.5 cid, in-line six cylinder engine gave better performance than similarly priced, or in some cases, more expensive cars. In standard form the undersquare engine (bore 3 inches, stroke 3 1/8 inches) gave 60 bhp @ 3800 rpm and 100 foot/pounds of torque at a very relaxed 2000 rpm on a compression ratio of 6.5:1. The motor was fed by a single downdraft Stromberg BXOV-1 carburettor with spark provided by a Delco-Remy distributor. Gearbox was 3 speed- the shift was column mounted, the four-wheel drum brakes had a kerb weight of 2230 pounds to stop. Amenable to tuning, enthusiasts were soon fitting twin-SU’s or Strombergs or Amals, extractors and giving the heads the usual port ‘n polish treatment to extract additional neddies which were easily found. 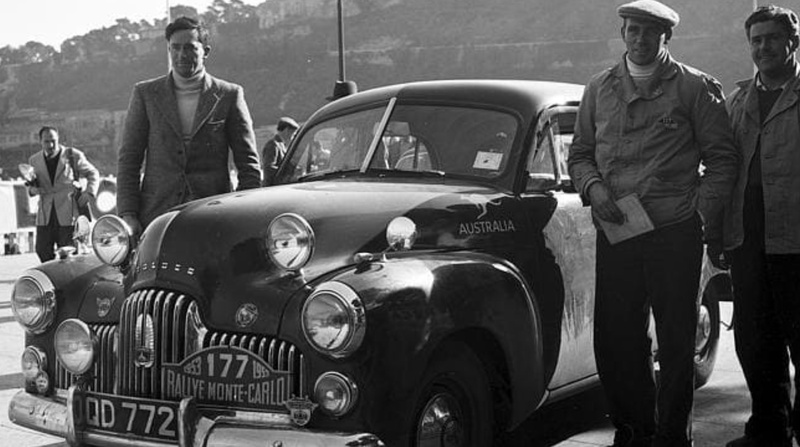 The post war explosion of the Australian economy with full employment, industry protected by high tariff walls and the ready availability of consumer credit made it possible for a family man or salesman to have not just day to day transport but also a car for club motorsport. 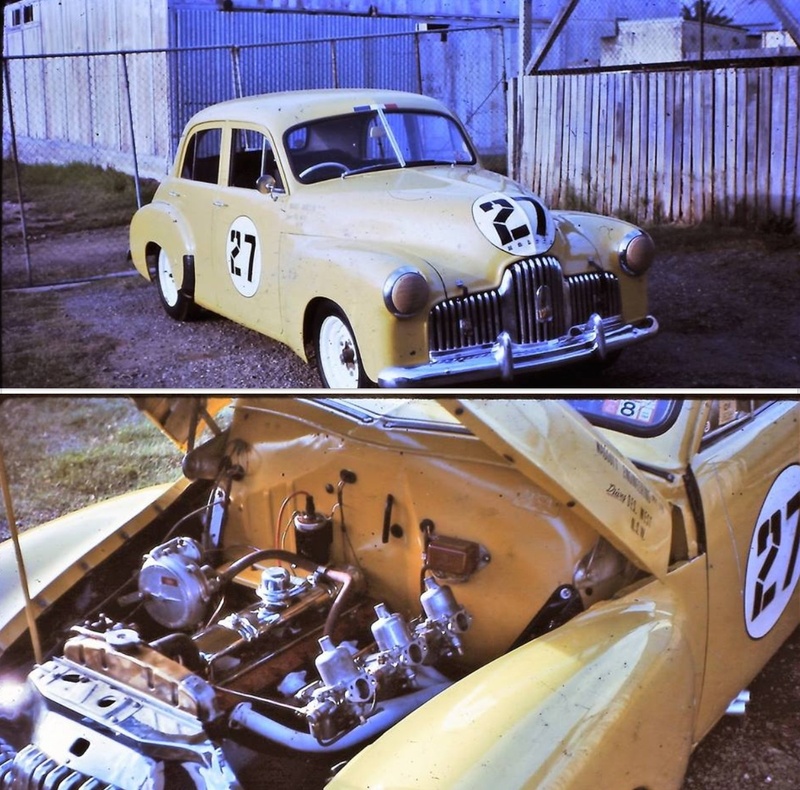 In many ways the work-horses of Australian motor-racing were MG’s of all sorts, both pre and post-war but especially T Types and the 48-215 or more colloquially the FX, and FJ ‘Humpy’ Holdens in the fifties and into the sixties- so many folks cut their racing teeth in these machines. 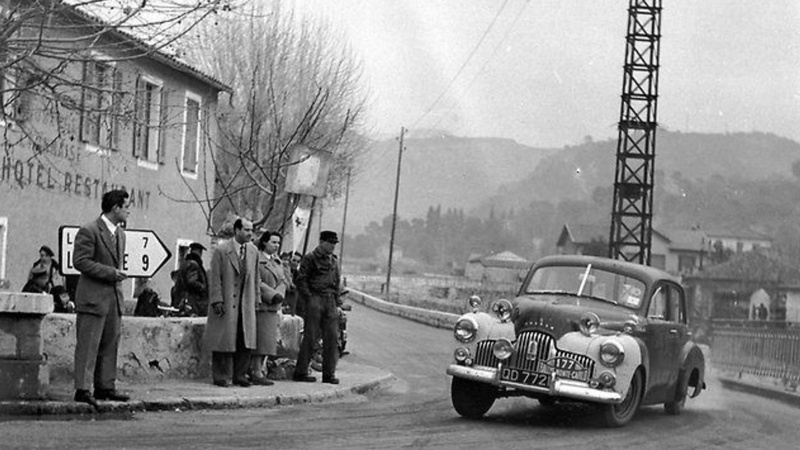 Touring car racing started in Australia at the sports inception, daily drivers in the earliest days were the cars which competed in trials and the timed speed events- hillclimbs and sprints within trials. 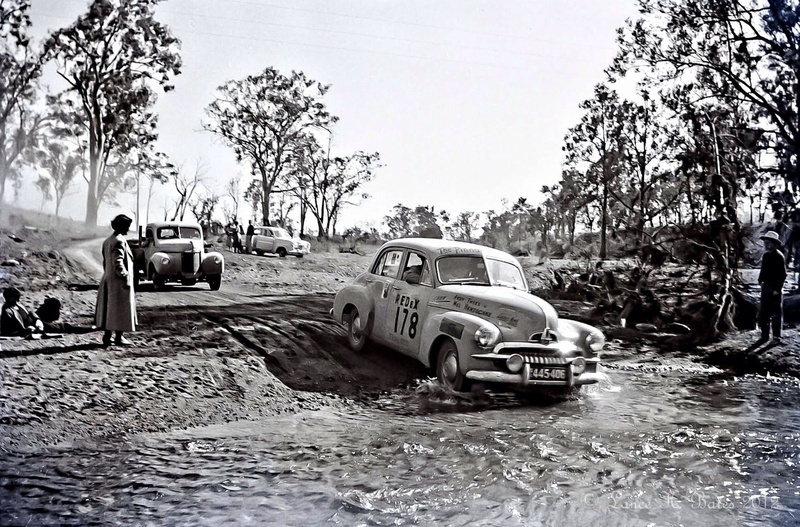 The first Australian Touring Car Championship (Australian Stock Car Championship) was held during the Australian Grand Prix weekend at Lobethal, South Australia in January 1939. 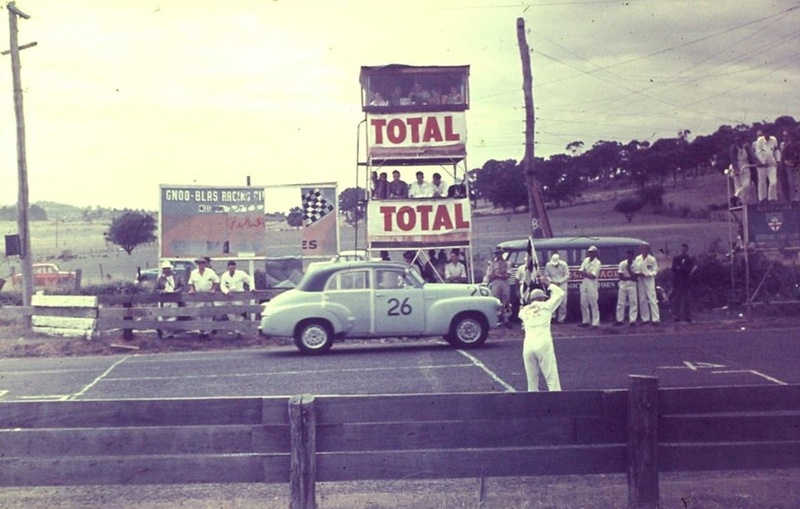 The inexorable and later rapid rise of tourers over pure racing cars in Australia was largely due in the 1950’s to grids chockers with Holden’s- spectators turned out in large numbers to a growing number of race-tracks to watch blokes compete in cars outwardly similar to those in which many of the punters arrived at the race meeting. 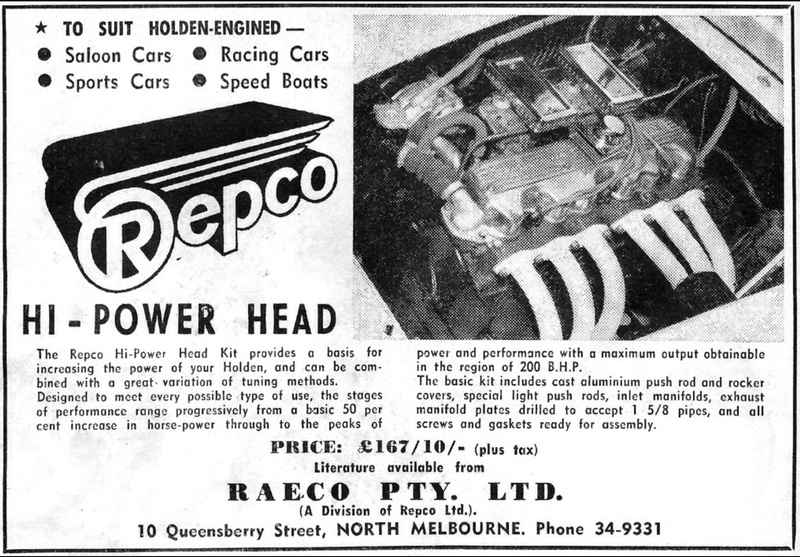 In fact by the end of the fifties the quickest of the Holdens were quite sophisticated racers incorporating Phil Irving designed Repco ‘Hi-Power’ cylinder heads, two or three carburettors with one or two cars fitted with Merv Waggott’s twin-cam heads to create an ‘ultimate spec’ Holden. 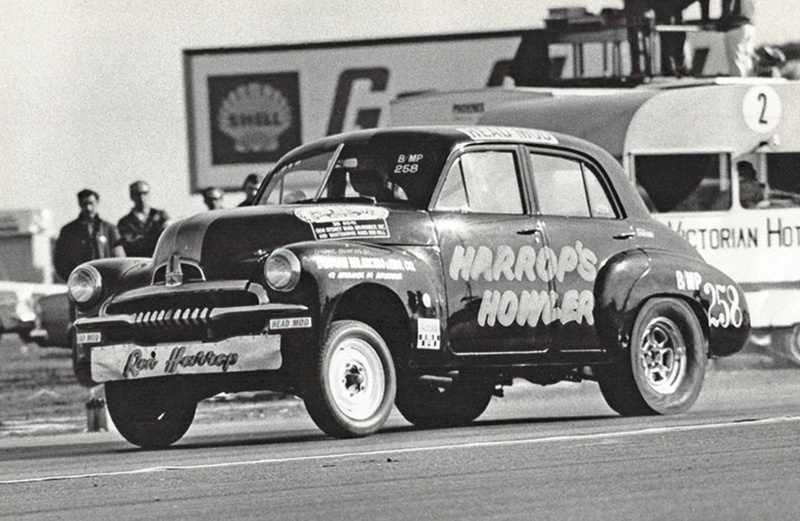 Great names who raced ‘Humpy Holdens’ included Jack Myers, the ‘Holden King of the mid-fifties’, John French, Leo and Pete Geoghegan, Max Stahl, Spencer Martin, Des West, Norm Beechey, Brian Muir, Warren Weldon, Bo Seton, John Goss and many, many others. Into the dawn of the sixties CAMS adoption of Appendix J put paid to the wild modifications which had started to proliferate- it became the category to which the Australian Touring Car Championship was run. ‘Series Production’ or standard road car racing provided the basis for further growth in tourers by spawning endurance classics such as the Phillip Island and later Bathurst 500, relative to racing cars which became progressively starved of sponsorship funds and less and less relevant to the ‘football, meat-pies and touring cars lovin’ Australian public. Be in no doubt my friends, Holden Motor Bodies Ltd in 1919 begat General Motors Holdens Ltd which gave birth to the ’48-215′, the intrinsic qualities of the design created a worthy competition car in modified form, the ready availability of which gave rise to the accelerated (pun intended) growth of touring car racing in Australia. 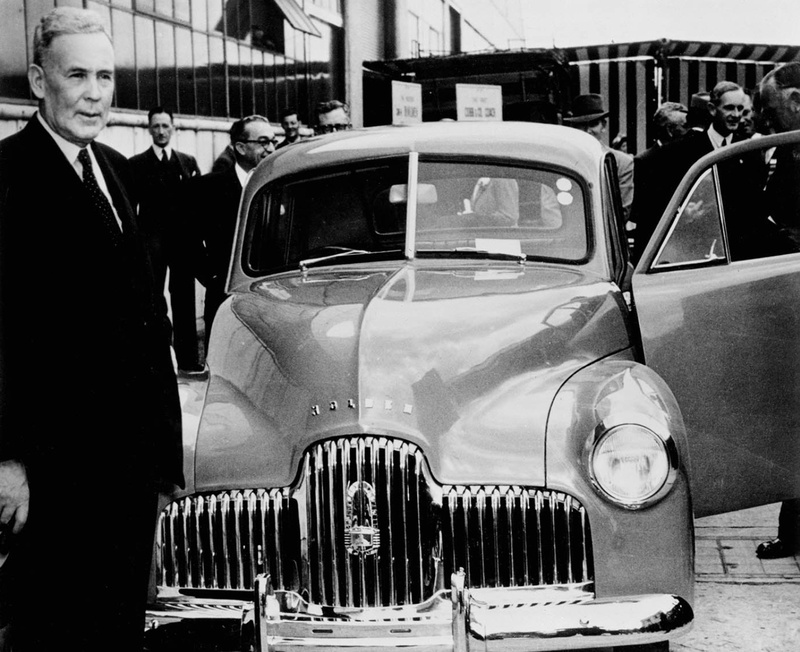 Laurie Hartnett strode the Australian manufacturing landscape like a colossus throughout his career but his pugnacious attitude to his American masters as to the design elements of an All Australian Holden led to his removal as Chief Executive of GMH Ltd in December 1946. 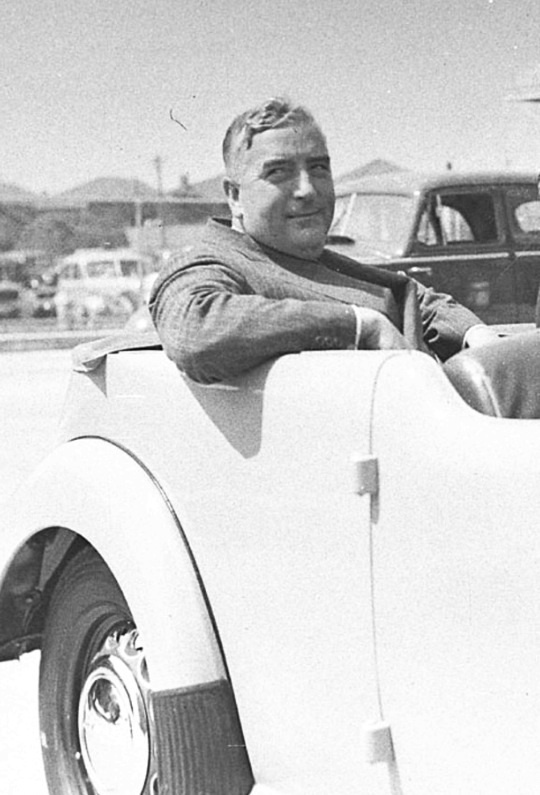 He was offered a role with the GM Corporation in the US but did not want to leave Australia- he never got to give birth to Australia’s own car- his own Hartnett was a notable achievement all the same. I’m not going to get lost in this tangent but click here to read in brief about a quite remarkable man. 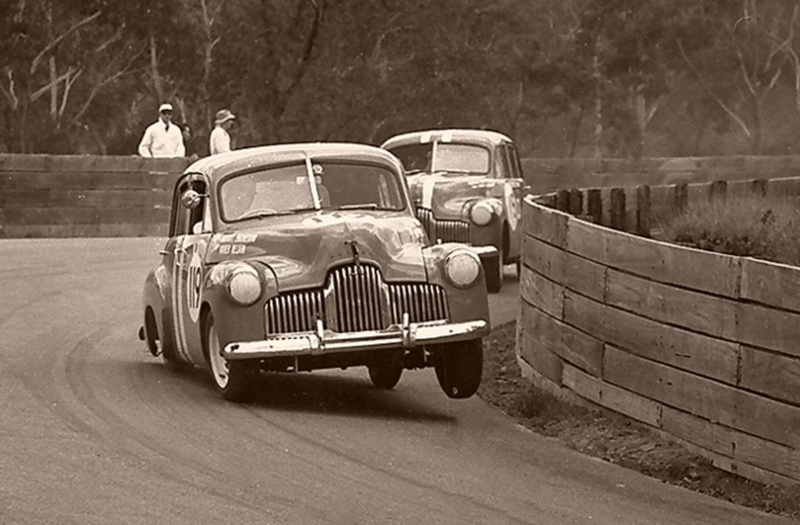 Whilst the focus of this article is the 48-215 and FJ as competition cars themselves the Holden Grey was adopted by many racers as replacement engines for their single-seater or sportscar originals or as the very basis of a special. The Bristol to Holden conversions of Cooper T20 and T 23’s are examples of the former and the Lou Molina and Sil Massola ‘Molina Monza’ an example of the latter. Des West’s 48-215 Racing Specifications..
Hottie and the new 48-215. Whereizzit tho? 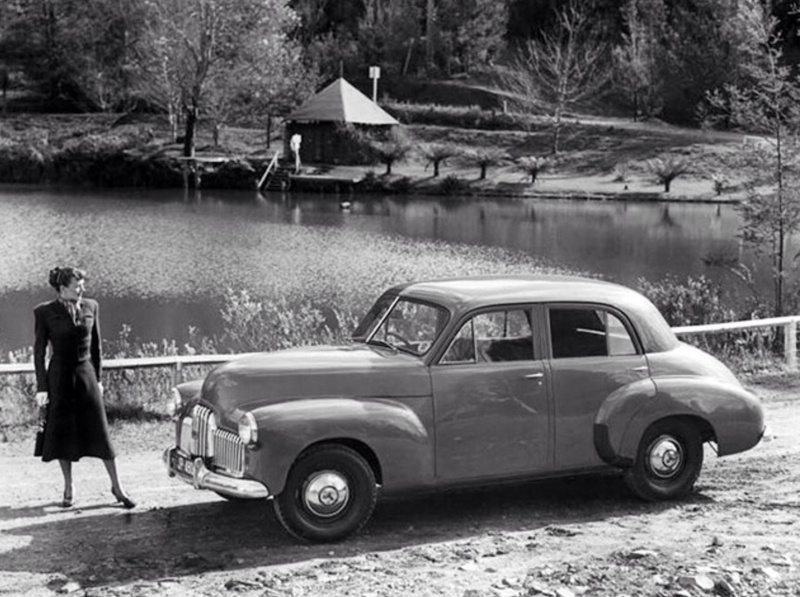 Being lazy buggers I’m thinkin the Holden PR mob would not have travelled far to do the photo shoot so my vote is Ringwood Lake on Melbourne’s eastern outskirts? In the last photo, what did the two men do with their legs? Leave them at home? there must be more room in the back of one of those things than it looks, no idea what model Vauxhall it is. Wasn’t the Australian Stock Car Championship, referred to above, held during the Australian Grand Prix meeting at Lobethal in 1939 rather than the South Australian Grand Prix meeting in January 1938? I’d better get that right seeing I am the dude making all the fuss about it- aged memories really are not a particularly reliable device! Mine isn’t anyway! 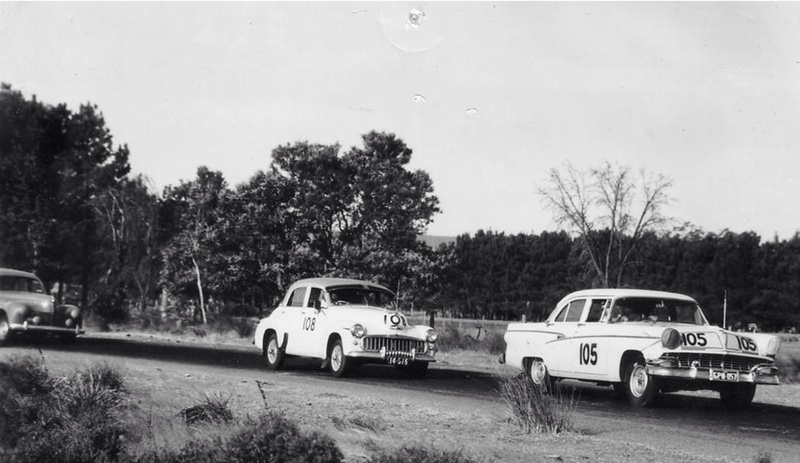 I don’t think it can be said that the CAMS Group E Series Production category spawned the Phillip Island / Bathurst 500 endurance race as that event was first run in 1960 and Group E was not to be introduced (according to the CAMS page in Racing Car News, December 1963) until 1 January 1964. Re-worded slightly to correct timings and meaning, the essence of which is that racing standard road cars fed the growth of ‘taxi’ racing exponentially throughout the sixties. I don’t think that can be the Sports Roadster as that is a two seater, and I doubt that Bob and Laurie had been asked to sit in the luggage compartment of one of those! Nice to know what it is, at 46 Menzies was a big unit wasn’t he? I don’t think Hartnett’s contribution is so much under-recognised as perhaps little-known. As a young accountant I was sent as part of the audit team to ‘John Hart P/L’ at the Princes Highway, Clayton- it was one of his many businesses- they were and may well still be importers of machine tools. It was nice to meet him albeit very briefly as a youngster, I was suitably awed but he was a polite man to a nuffy just punchin’ a few numbers.